I know big exhibitors have to keep their roses in perfect condition and the only way is to keep on their spray program. I admire them for taking on that task but a majority of gardeners do not want to do that. When we talk to novices and start spouting about all those toxic chemicals, they will surely find the nearest exit to get out of where you are. It’s not a good way to introduce new members to grow roses. We have to find an alternative way to entice them to grow roses the easy way and there are other ways. Years ago, I sprayed my roses every week. Then about 15 years ago, I decided to stop spraying because I could not stand the smell of those chemicals to the point of closing all my windows after I sprayed the garden. Top exhibitors would disagree with this notion but I was not going for the Queen. I was more interested in rose arrangements at that time and showing my garden at our annual garden tour. I need color in the garden and fragrant roses. I discovered Bayers 3-in-1 would do the same job so I used that. Then Bayers stopped selling them in New York. The first year, I did not spray, the garden looked terrible. Some of the roses got defoliated completely by August. But I ignored it as I looked for other alternatives. For starters, I discovered Gardens Alive, a purveyor of earth-friendly products. I started spreading beneficial nematodes on the edge of the lawn in the spring and fall. They kill the grubs which grow up into Japanese beetles. I got rid of the beetles. For aphids, there are some environment friendly methods you can use. Ladybugs and lacewing larvae will eat aphids. I used ladybugs. One rose supplier I asked told me to just give them a good drench of water. A heavy thunderstorm will probably do a better job than any dose of chemical spray. Since aphids cannot fly, once you knock them off the plant, they will not be able to return. Red spider mite is a relative of the true spider and only occurs in the late spring/early summers in very dry conditions. Once you get an infestation, it is very hard to control but the most important thing to remember is that a very fine spray must be used on the sprayer and the plant must be completely wet. An application of dormant oil in late winter will kill eggs wintering on the ground. The telltale sign of an infestation is the leaves appear to lack color and eventually fall off. The mites, which are very, very small, appear on the underside of the leaves and are reddish brown. I had a Graham Thomas in a pot in front of my house and for two years got spider mites. Since I don’t spray, I kept on cutting the infected stem. I decided to give it one more chance and move the pot to the back yard where it got partial sun and pruned it drastically in February. Lo and behold it fares better at the new location and looks happy. To take care of diseases like blackspot, I used Pyola from Gardens Alive. I also bought Serenade from Possum. Messenger and Mighty Plant are excellent products too. 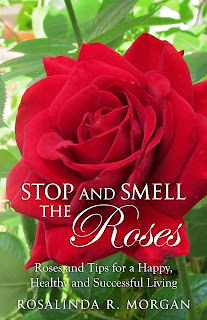 I tried Roses Alive this year and the roses look very healthy without spraying toxic chemicals. I don’t own a sprayer to prove my point. Most important of all is to keep your garden clean, tidy and weed free. Get rid of diseased leaves. I go out there every day and if I see leaves with blackspot, I pull them out. If you have pine straw mulch, it is hard to pick up the diseased leaves stuck between the straws so I opted for black cedar mulch. Check your garden every day to see what is going on. Unless it is raining, I’m out there in the garden everyday doing something or just walking around and enjoying the beauty that surrounds me. That’s the reward of gardening!